Do you enjoy drinking wine at parties? 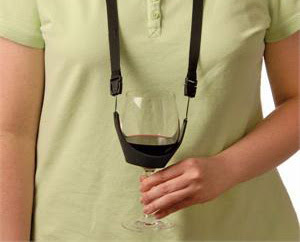 Then you might like this nifty invention, the wine glass holder necklace! It's hands-free drinking like you've never seen before. The necklace sling allows you to load up on a plate full of tasty snacks at the same time. There is also no chance of mixing up your glass with someone else's. Or if you're the animated sort, it might also prevent you from accidentally splashing someone close by with your drink! Although you could stain your own clothes if you're not careful. On a more serious note, you get to keep your glass right where you can see it so no one can slip something they shouldn't into your drink. A woman can't be too careful these days. This wine glass sling is available from the Gifted Grape for $9.95. Did Cleopatra Swallow the Pearl Whole with her Wine? These Wine Slings were on Cougar Town just this past week; Courtney Cox bought them for all her wine drinking buddies! Now my friends would LOVE that! lol! Great idea for Mardi Gras as well!!!! Hahahaha..
Then, all you need is an IV! Wine glass holder necklace... now why didn't I think of that?"